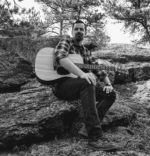 Geoff Clark is a guitarist and songwriter living in Estes Park, Colorado. He blends Americana, Alt-Country, Folk, and Rock into a unique style of his own. He peppers in a few Irish drinking songs to encourage a jovial and lively atmosphere at his gigs. His eclectic musical tastes stem from growing up in a musical family in southeastern Louisiana. He began playing guitar at the age of twelve, and has played in a variety of bands in New Orleans and Washington DC. Now his solo guitar and vocal stylings entertain crowds across Colorado.